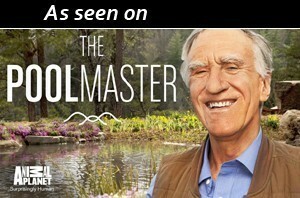 Anthony Archer-Wills is the world-renowned pool, pond, water garden, and naturalistic water feature artisan who is seen on Animal Planet’s The Pool Master. He masterfully creates outdoor environments that indulge the imagination and delight the senses. Anthony collaborates with BioNova™ on the design of BioPools® and Natural Swimming Pools in unique and distinctive outdoor living spaces at homes all across North America. Would you like Anthony to create your backyard oasis? He can work his magic with a new pool or with your existing pool, and he can be engaged at the level of service that best fits your project ideas and budget. The first step to a luxury swimming pool that is completely chemical-free and all natural is to click here for a complimentary telephone consultation. The first public Natural Swimming Pool in North America opened to the public on July 24, 2015! Located at Webber Park in Minneapolis, MN, the 21,000 square foot swimming pool is completely chemical-free and is purified naturally using BioNova™’s patented biological filtration system. A constructed wetlands regeneration zone adjacent to the pool is home to more than 7,000 aquatic plants and a multitude of beneficial microbes which keep the water clean and healthful for hundreds of swimmers every day! To read more about this innovative and groundbreaking project, please visit our BioNova™ News Archive or take a look at the Minneapolis Park & Recreation Board (MPRB) website. 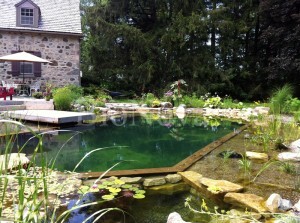 What is a Natural Swimming Pool or Natural Swimming Pond (NSP)? How does it work and how is it different from a traditional pool? Is my climate suitable for an NSP? Find answers to these questions and many more by watching our 30 minute BioNova™ Podcast with James Robyn, BioNova™ President and CEO, or read this Expert Interview on NSPs from PDH Academy with BioNova™ CKO, Alan Weene. 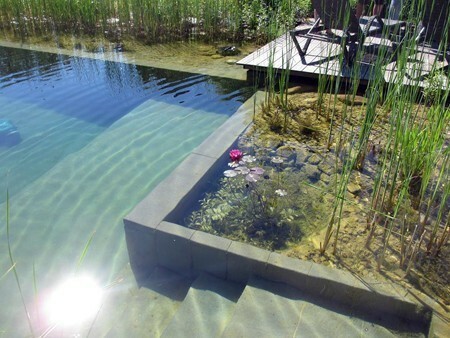 BioNova™ Natural Swimming Pools are completely chemical-free, eco-friendly, and healthful for swimming. 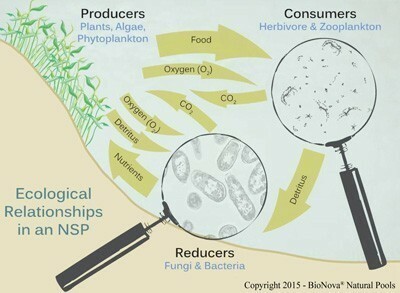 NSPs replicate and optimize the conditions found in naturally occurring bodies of water like ponds and lakes, providing water that is clean, clear, and purified the way Nature intended – with aquatic plants, beneficial bacteria, and helpful microbes. With a broad range of design options from traditional rectangular pools to completely naturalistic swim ponds, the possibilities are limited only by your imagination! Start here to find inspiration for your NSP project! BioNova™ offers the BioPool® family of preconfigured NSPs to provide a complete range of design and construction options for your Natural Swimming Pool. Whether you prefer a classically formal pool, a naturally integrated rock-rimmed pool or even wish to transform your existing chemically-treated in-ground pool into a BioNova™ Natural Swimming Pool, we have the right design options to meet your landscape goals and your budget. BioNova™ is the clear leader in Natural Swimming Pools in North America, with more successful installations and satisfied clients than all other systems providers combined. 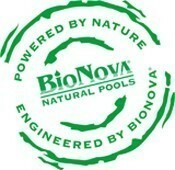 For proven results, the natural choice is BioNova™ Natural Pools! All BioNova™ NSPs are designed and built by licensed BioNova™ Dealers and conform to the highest standards for water quality and bather health and safety. Each Dealer has been trained to create these unique, sustainable watershapes in a variety of settings, and they are standing by to help make your wildest landscape dreams come true! Looking to expand your business to stay on the cutting edge of green technology? Do you want to distinguish your company as a true pioneer in environmental sustainability? 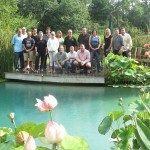 From its North American Headquarters in New Jersey, BioNova™ provides world-class training and support for pool industry tradespeople, contractors, and landscape design professionals to bring the state-of-the-art in Natural Swimming Pools to their communities. With the ever-expanding population of environmentally conscious consumers, the natural choice for your business is BioNova™ Natural Pools. 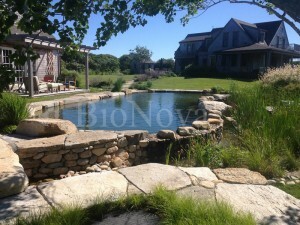 BioNova™ is actively designing, building, and educating people about Natural Swimming Pools all over North America. Click here to read our Blog and see What We’ve Been Doing. 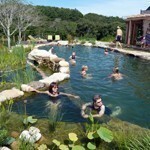 BioNova™ leads the way in education about Natural Swimming Pools. Our team of experts frequently conducts Webinars and Full Day Seminars in convenient locations around the country. 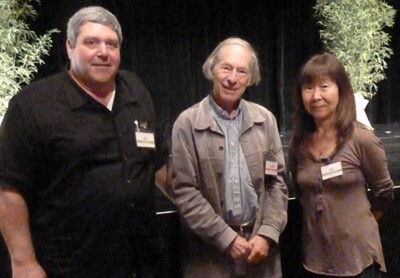 Can’t attend one of our Upcoming Lectures? No problem! Familiarize yourself with BioNova™ NSPs at your own pace by watching our informational videos. The 30 minute BioNova™ Podcast seen below as well as other helpful videos can be found in our NSP Video Gallery. The first Swim Pond was built in Europe in 1983 by Werner Gamerith. 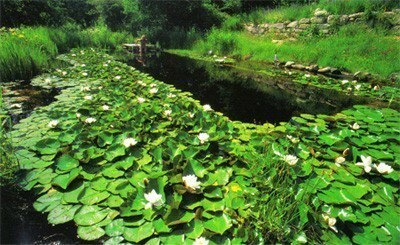 The creation of this Swim Pond, which is still fully functional today, led to the development of over 20,000 successful installations worldwide. 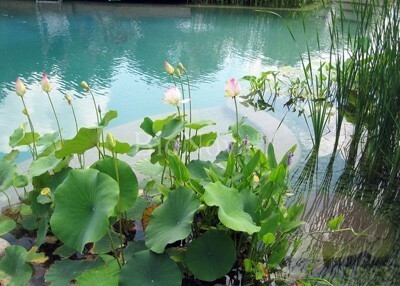 BioNova’s roots in North America date back to early 2007, when James and Hae-Sun Robyn, who are also the owners of Rin Robyn Pools (founded in 1958 by James’s father), decided to find a method for using constructed wetlands technology as a swimming pool filter. 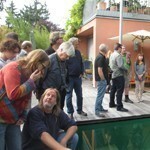 James learned that this technology had been developed over 20 years earlier in Europe, starting with the Swim Pond built by Werner Gamerith. James, who holds an MBA in International Management with a concentration in German, and Hae-Sun, who graduated from high school in Frankfurt, Germany, decided to go to Germany to investigate. In 2008, the Robyns formed BioNova™ Natural Pools, a US corporation offering licenses, technology and intellectual property to firms throughout North America. As a result, BioNova™ was the first NSP systems provider to build an NSP in the USA and in Canada. Today, BioNova™ continues to lead the way in North America, with more Dealers in more locations, and more NSP installations than all other systems providers combined. BioNova’s unique proprietary equipment is available exclusively to licensed Dealers. Additionally, BioNova™ maintains professional staff in New Jersey and Minnesota to provide classroom and in-field training, consulting and marketing guidance, and design and technical support. Click the following link to meet our staff. BioNova™ is proud to be a founding member of the US-based Association for Swimming Ponds and Natural Swimming Pools (see ASPNSP.org). 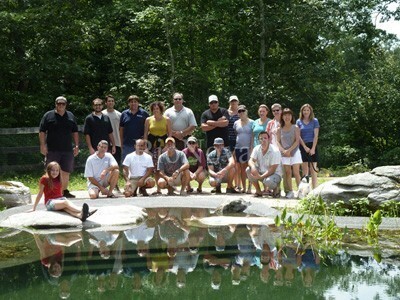 The ASPNSP exists to develop and distribute tools and resources to homeowners, commercial operators, designers, and builders for Swimming Pond and Natural Swimming Pool knowledge, education, advocacy, regulatory compliance, and professionalism. 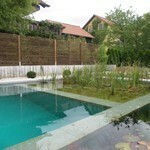 Natural Swimming Pool, shortened by BioNova™ to NSP, is the typical English term for these swim ponds. In German-speaking Europe, where they originated, the terms are usually Schwimmteich (swim pond) or Badeteich (bathing pond). NSPs vary greatly in size, from plunge pools to full exercise lap lengths, and in design, from traditional pool shapes to more naturalistic pond shapes. 1) The water of the NSP is contained in a vessel that isolates it from ground water and from surface water runoff. The vessel construction can be concrete, PVC membrane such as PoolHide®, or other waterproofing system. 2) The swimming zone is physically separated from the regeneration zone (typically a planted area, also termed a water garden) in order to protect the plants. The separation can be achieved by an underwater wall dividing a single vessel, or by locating the regeneration zone in a second vessel. 3) No chemicals or devices are used to disinfect or sterilize the NSP water. All cleansing takes place by natural biological processes. 4) The swimming zone is designed, permitted, and constructed as a residential swimming pool according to all local codes. This provides the residential homeowner with peace of mind knowing that their NSP conforms to the rigorous safety requirements of the American National Standards Institute (ANSI) / Association of Pool and Spa Professionals (APSP) regarding entry and exit, depth configurations, slopes, diving envelopes, hydraulic design, electrical safety, and fencing. 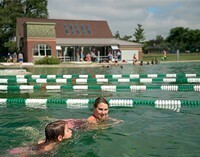 Click the following link for an article about swimming pool safety. The NSP represents a new paradigm for recreational watershapes because it is a completely chemical-free, environmentally friendly, ecologically harmonious, and sustainable choice for a swimming pool. Chemical-free means no chlorine, no bromine, no biguanide, no pH adjusters, no alkalinity adjusters, no algaecides that are toxic to plants, no calcium hardness increasers, no agglomerating clarifiers or flocculants, no oxidizers, and no shocks. No manufactured chemicals are used whatsoever and no toxic byproducts are formed in the water. Being chemical-free eliminates the environmental costs and embodied energy associated with the extraction, refinement, manufacturing, transportation, packaging, and distribution of those chemicals. Another environmental benefit of the NSP is its very low energy usage based on efficient design and energy conserving pump and filter hydraulics. Many BioNova™ NSP designs can be built to operate with approximately the same power consumption as a 100 Watt light bulb! No energy-using devices (e.g., salt chlorine generators, ozone, ions, or UV light) are incorporated. Only natural biological processes are harnessed to clarify and purify the pool water. NSPs function on the scientific principles found in limnology, the study of fresh inland waters (e.g., ponds, lakes, streams and rivers). Mankind evolved on this planet in harmony with fresh water sources, and human life is compatible with the wetland processes that naturally purify and clarify fresh water. These natural processes involve many different species of beneficial microbes and beneficial bacteria as well as aquatic plants. As we know from many medical sciences, beneficial microbes and beneficial bacteria are key to our health, well-being, and quality of life. The NSP follows Nature’s design by carefully implementing principles of limnology and biomimicry, i.e., by constructing a wetlands ecosystem that replicates and optimizes natural processes. 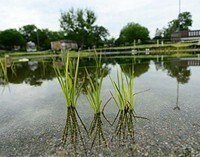 These natural biological cycles utilize beneficial microbes and beneficial bacteria to convert detritus and impurities in the water into nitrates that become food for the carefully selected native and adaptive aquatic plants. The healthy, well-nourished plants effectively out-compete (starve out) algae and undesired microbes for available resources. BioNova™ has registered US and Canada patents on the methodology for accomplishing the natural biological cleaning of NSP water. These patented processes are the result of years of experience and hundreds of NSP installations in climates of all different types including the tropical Philippines and Mauritius, the Swiss Alps, and Scandinavia. In North America, BioNova™ has successful installations in all climate zones from relatively hot environments like Texas and California, to the relatively cold environments of the Rocky Mountains, Minnesota, Maine, and Ontario. Click the following link to view our gallery of BioNova™ NSPs in North America. BioNova™ Dealers are successful applicants representing the leading firms in watershapes and swimming pool design and installation. Each Dealer is awarded a protected geographical market area, and is provided with classroom and in-field training sessions in North America and Europe. BioNova™ Dealers possess specialized knowledge and skills, and are dedicated to the best practices in the design, construction, and maintenance of NSPs. To learn more about applying to become a BioNova™ Dealer, please click here. BioNova™ Dealers are trained in the five (5) types of NSPs as defined by the German FLL (Forschungsgesellschaft Landschaftsentwicklung Landschaftsbau) Guidelines. These FLL Guidelines have been adopted by most of the EU countries due to their having incorporated the best current practices for NSPs, and are referenced by many other countries throughout the world. Biotop is the German word for a biotope, which is an ecologically stable community of living organisms in a symbiotic relationship. The nomenclature associated with the 5 different types of NSPs has now been widely recognized globally in discussions, educational materials, and scientific literature. Types 1, 2 and 3 are single-chamber designs, also called 1-pot NSPs. Types 4 and 5 are multi-chamber designs, or 2-pot NSPs, where the swimming zone and the regeneration zone(s) are installed in 2 or more vessels. BioNova™ Dealers are skilled in the design and installation of fully customized NSPs of both 1-pot and 2-pot structure. Clients are able to realize their vision for complete enjoyment for family and friends, incorporating beach entries, spas, sun shelves, slides, waterfalls, lap lanes, sport equipment, etc. All sizes, shapes, and amenities can be included. The possibilities are limited only by your imagination! Another BioNova™ approach to meeting a client’s needs for shape, size, and amenities is the BioPool®. Preconfigured in either 1-pot or 2-pot technology, the BioNova™ BioPool® is an affordable and cost-effective solution to a Natural Swimming Pool. The BioPool® includes all specialized biological filtration equipment and technology and is built with the proven steel wall construction technology that has been used successfully throughout the pool industry since the 1950s. The BioPool® is lined with PoolHide® for effective and durable waterproofing of the NSP vessel(s). Please click the following link to learn more about the BioNova™ BioPool®. Every BioNova™ Natural Swimming Pool is constructed by a licensed Dealers who is a dedicated and knowledgeable Natural Swimming Pool professional, highly trained in Design Elements, Limnology, Construction Techniques, Hydraulics, and Filtration Systems. Your peace of mind is ensured by the controls enforced through our detailed Quality Process: every BioNova™ Natural Swimming Pool is constructed to the rigorous BioNova™ standards for design, engineering, and construction. As part of the Quality Process, each homeowner will receive a customized Operations Manual, a Certificate of Warranty for proprietary BioNova™ equipment, and a numbered Certificate of Authenticity. Please enjoy the video below which describes our commitment to Quality in more detail. What If I Already Have a Swimming Pool? Can It Be Converted? Often homeowners have an existing chemical-based swimming pool but would prefer a BioNova™ NSP. BioNova™ Dealers are skilled in assessing site-specific conditions, homeowner design preferences, and budget considerations in order to select one of the three (3) proven methods of converting an existing pool to an NSP. Due to the methods and technologies employed, the conversion process can also be an effective renovation project. Click the following link to learn more about converting and renovating a chemical pool as a chemical-free, environmentally responsible NSP. In addition to about 20,000 residential installations, over 900 NSPs throughout the world have been successfully constructed and enjoyed in venues both public (municipal) and commercial (hotels, resorts, campgrounds, or training schools). BioNova™ has been instrumental in the design and construction of the first Public NSP in North America. 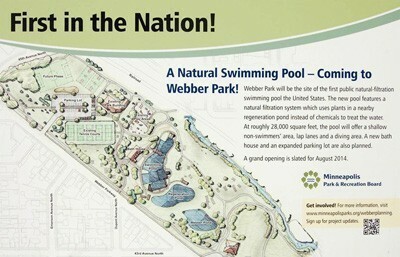 The Webber Natural Swimming Pool for the City of Minneapolis Park & Recreation Board provides 21,000 sq.ft. of swimming zone with a separate 16,000 sq.ft. of regeneration zone; both summer swimming and winter ice skating will be available. With its grand opening in the summer of 2015, the Webber Park NSP will join the scores of BioNova™ Public NSPs already being enjoyed throughout Europe. Copyright (C) 2019 BioNova™ Natural Pools. All rights reserved.